As much as I adore Pixar, I’ll be the first to admit that most of their sequels are unnecessary. These films tend to retread the same ground their predecessors did, especially “Monsters University” and “Finding Dory,” which makes for a fine repeat experience. 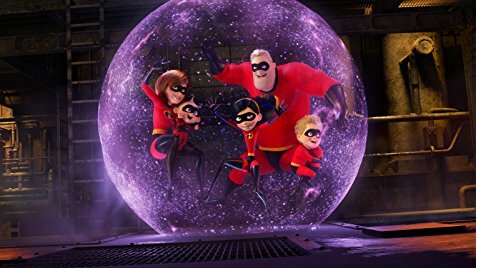 However, if there was one Pixar film that I always felt deserved a sequel, it was “The Incredibles.” The whole premise of a family of superheroes lends itself to different stories and lessons to be learned, especially from the angle of Dash and Violet as they learn more about the changing world around them. Honestly, it surprises me that it took Disney and Pixar 14 years to make a sequel, especially since superheroes have been a big draw at the box office for the last ten years. Going into “Incredibles 2,” I was curious to see how they would handle this film, seeing how it takes place directly after the events of the first film, which I felt worked best as a mid-life crisis for Mr. Incredible (Craig T. Nelson). I’m of the opinion that a sequel should have been set a decade or so after the first film and show the kids as adults, while their parents grow so old that they can’t fight crime anymore. Instead, we get a film that builds off what the previous entry started while also retreading most of the same ground as the first film, except with Elastigirl (Holly Hunter) taking the spotlight. Because of the events of the last film, the Incredible family is without a home and a sustainable source of income, and due to a recent incident with a super villain, the have to lay low for a while. But when the CEO of a tech company, Winston Deavor (Bob Odenkirk), meets with Mr. Incredible, Elastigirl and Frozone (Samuel L. Jackson), he offers to help bring up the popular opinion on supers by showing their potential. This leads Deavor to contract Elastigirl to take a job fighting crime in a big city, including a new super villain named the Screenslaver, while Mr. Incredible is forced to stay home and raise the kids, just as their baby Jack-Jack discovers his many super powers. Basically, this is a retread of the first film, but with the roles of Mr. Incredible and Elastigirl swapped. That’s not to say “Incredibles 2” is a bad experience, but that it is more of the same. I am willing to forgive this, since it has been 14 years since we got to see the family dynamic and the kind yet dysfunctional relationship between its super mom and dad. The writing and dialogue stays as fresh and strong as the first film, while the action is as dynamic and inventive as ever. The best scenes in the movie are with Mr. Incredible at home as he learns to go from a superhero to a father in this modern age of teenage rebellion and common core math. Rather than resenting that he can’t be the hero he wants to be, there’s a genuine effort to improve the lives of his children despite the struggles he faces. These scenes are simple and understated, but powerful and charming, showing the character progression for Mr. Incredible as he overcomes his mid-life crisis. However, the film relies a bit too much on smaller moments from the last film that were best left understated. The biggest example of this is Jack-Jack being in too much of the movie. He is given more screen time than any other character outside of Elastigirl, and the gimmick of his unpredictable powers wears thin after the first couple scenes. They devote so much time to this that Dash gets no development outside of having trouble with homework. As a result, it’s hard to say if this film is successful at building its own identity when it copies many of the gags from its predecessor. But the strength of “The Incredibles” was always that it felt so relatable and relevant while embracing the fantastical, and “Incredibles 2” does this wonderfully as well. Quiet moments of Mr. Incredible and Elastigirl talking about who will have to get a job or Mr. Incredible admitting his mistakes to his children are counter balanced with a stunning helicopter chase through a busy metropolis or Elastigirl chasing an out-of-control bullet train. While the wonder of the children discovering the full extent of their powers is gone, this is replaced by them learning to restrain themselves and grow as people rather than heroes. Even if the film relies too much on Jack-Jack, it is still about the family at its core. Overall, “Incredibles 2” is a fine family picture and another solid outing from Pixar. Most of the wow-factor from the first film isn’t here and it does retread most of the same ground, but it is charming and relatable when it needs to be. The animation is improved and the cast is still as strong as it was 14 years ago. And although it has its weaker moments of repetition, it still succeeds at being a larger-than-life family piece that wins audiences over with its characters.